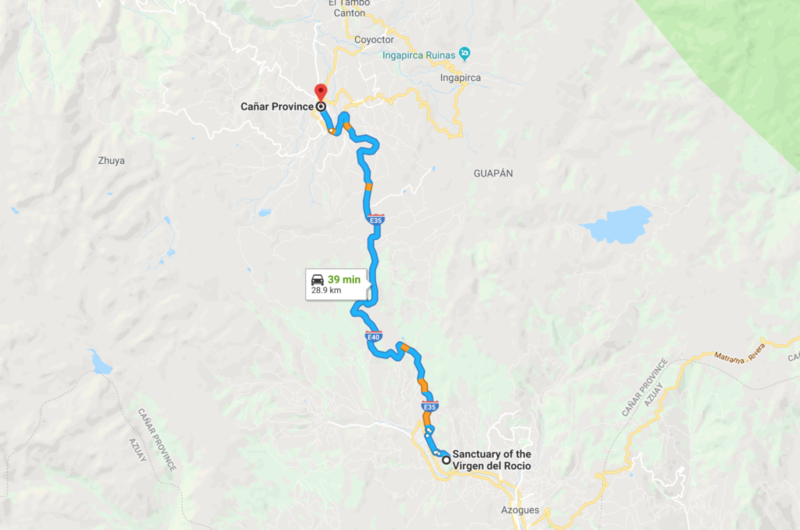 This is Part 2 in our 3-part series from an excursion we took with Flavio from Polylepis Tours northeast of Cuenca, Ecuador to Biblián, Cañar and Ingapirca. 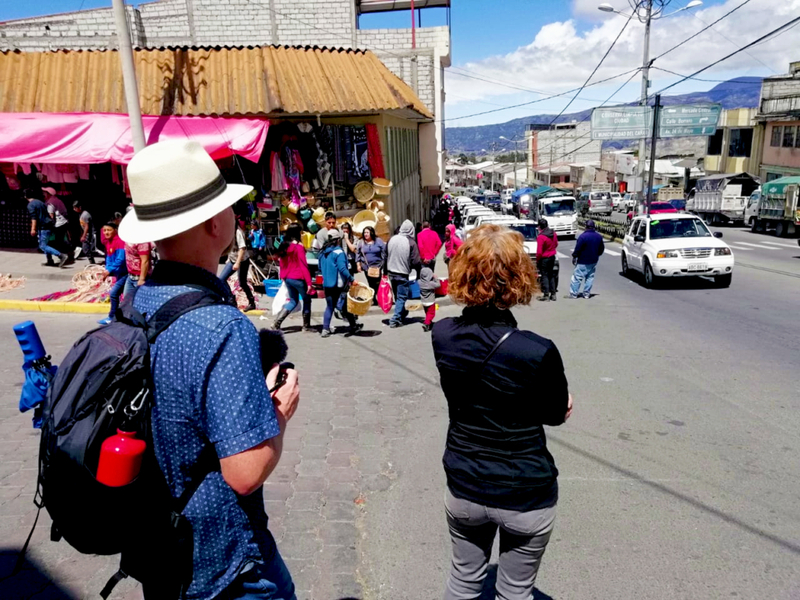 You can view the video from our first stop in Biblián here: La Virgen del Rocío | The Church Built Into a Mountain in Biblián Ecuador 2019 (Episode 51: Part 1). 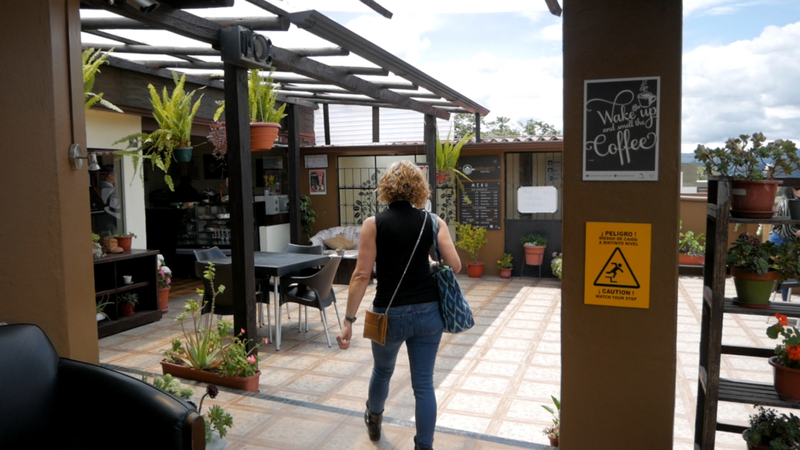 Our second stop was in Cañar, Ecuador. 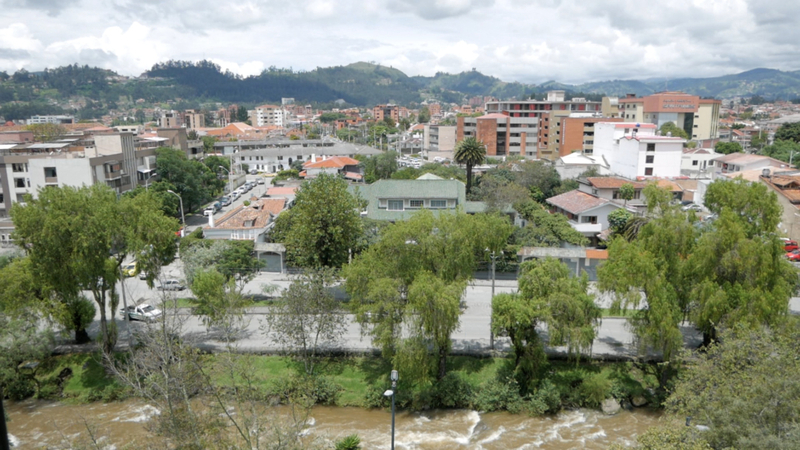 Cañar is the ancestral home of the indigenous Cañari people who have lived in this region of Ecuador for nearly 1500 years. 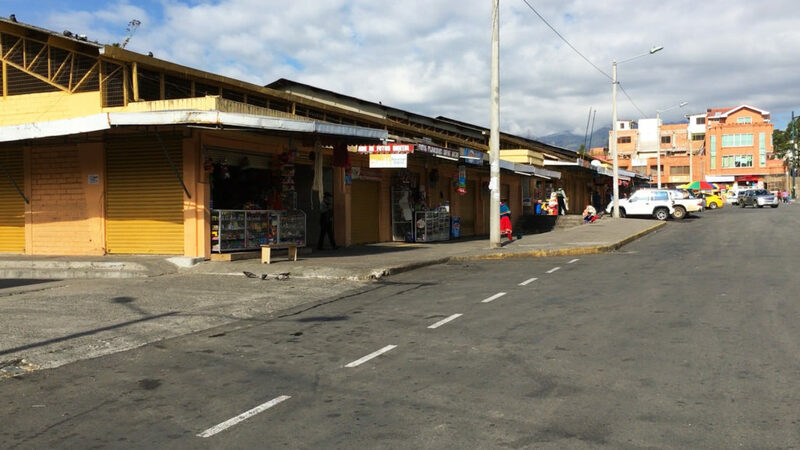 Every Sunday, people come from miles around to the indigenous market in the center of Cañar. 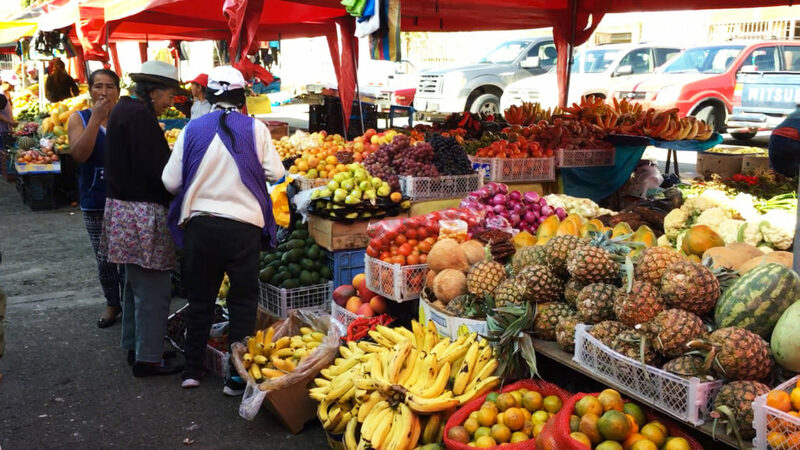 You can find all sorts of things at the indigenous market, such as jewelry, rope, clothes, fresh fruits and veggies, beans, seeds, masks, toys, etc. The masks shown below and in the video were for the New Year’s Eve celebration. 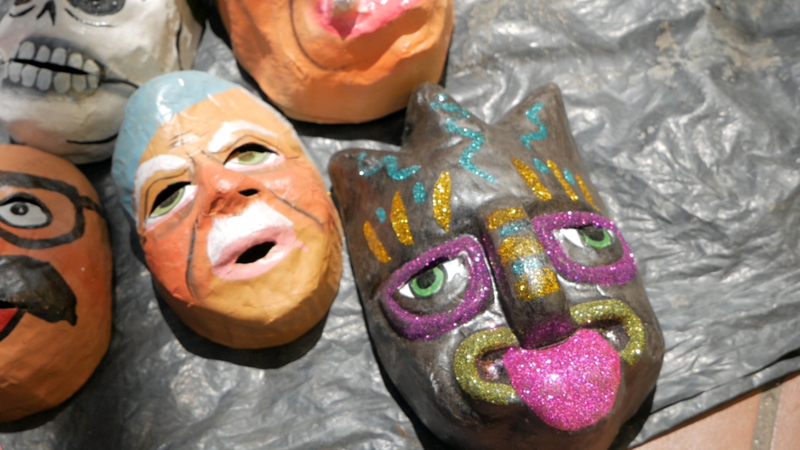 People wear these masks to act out a scene and then often burn the masks along with their monigotes. 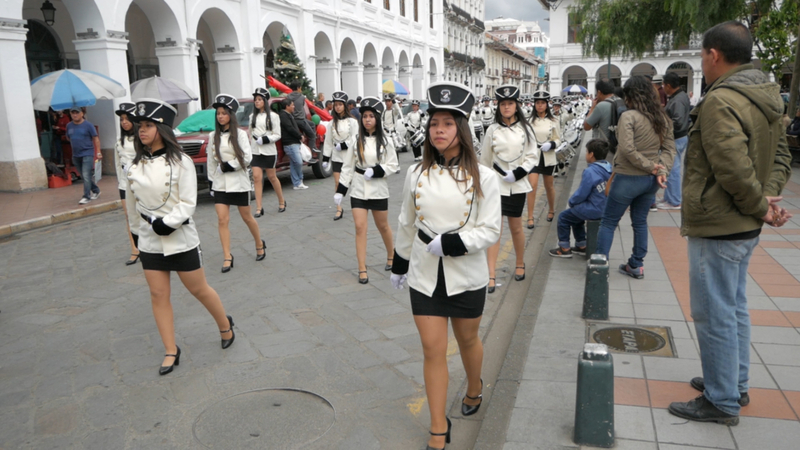 You can learn more about this in our New Year videos: Preparing for New Years in Cuenca and New Year’s Eve Apocalypse in Cuenca Ecuador. We thought the tire planters were really cool. 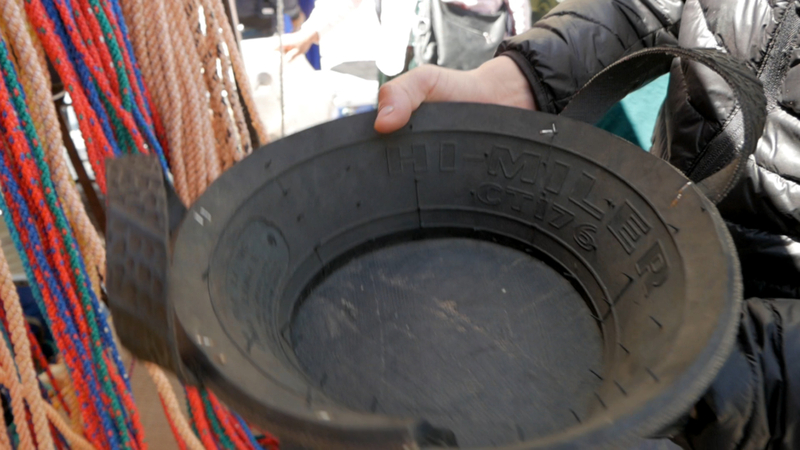 They take old tires and turn them into planters or water bowls. They come in all different sizes, from small to very large. On our drive through the countryside from Ingapirca back to Cuenca we saw lots of these in people’s yards. Our next stop is Ingapirca to visit the Cañari and Inca ruins. We’ll show you that interesting experience in our next video. And there was Daisy sneezing over there. and the indigenous marketplace there. it was massive! It was..
>> JP: It was a lot of people. >> JP: Lots of indigenous people. It was really neat to see their dress. >> JP: Alright, so we’ll see you after this video is over. >> A: See you soon. >> A: We are in the city of Cañar. We’re walking through the Sunday indigenous market. get everything from wholesale grains, beans..
We’ve got fruits and vegetables behind us. jewelry, a little bit of everything. and they charge a pretty penny for it. We did see some really cool reuse of tires. and even use the large tires to plant trees. for example, look at the womans.. The little bows.. on the hat..
the womans have bows to back are married. They put in front, are singles. >> A: Ah. I didn’t know that. You know “trueque”? Trueque is like interchange. >> A: Oh. Like bartering. >> F: We call it trueque in Spanish, trueque. Wheat, barley, faba beans, different kinda beans. Corns. Different kind of corns. >> A: I see that. JP was sick so we missed it. observe the burning of the monigotes (effigies), fireworks. representing this kind of mask a lot of people. representation of the end of the year. >> A: Oh. Okay. Wow that’s really cool. Who knew it was a cousin to the potato. It’s a very small pear from here, from Cañar. What is that reddish plant there? >> F: The red one, the name is ataco. and another kind of plants, flowers.. This is named Agua de Frescos. >> A: Oh. I see. >> F: [Inaudible] and all these kind of plants. >> A: T hat’s really really pretty just on its own. >> F: Yeah. It’s pretty and its really healthy. out of all that. So how do you do that? >> F: You need to boil it. >> F: Nah. It’s possible.. with a big family..
>> A: Yeah. Oh, I see. Okay. >> F: But only for you, only piece of the plant. Boil it and make a tea with sugar or without sugar. You decide. It is so good. >> F: Agua de Frescos. >> A: Agua de Frescos. >> A: We enjoyed it. It was a lot of interesting people watching. meaning there was a big variety. I was surprised how many nylon ropes I saw. >> JP: Yeah. There were a lot of ropes. >> A: Lot of rope for sale in the indigenous market. >> JP: And those rubber tire things were cool. >> A: Yeah, those were cool. lotions and potions and potions. then they chase em out. >> JP: Yeah, they chase them out of there. >> A: We didn’t see anything that exciting. normal Sunday at the market. especially.. they can’t be more than 4 feet tall. >> A: No.. they’re pretty small. >> JP: Yeah, Amelia is a head taller. That’s a lot. That says a lot. Alright, thanks for tuning in. >> A: We’re in the zone. Let’s do it. >> JP: We’re in the zone? >> A: We’re in the zone! 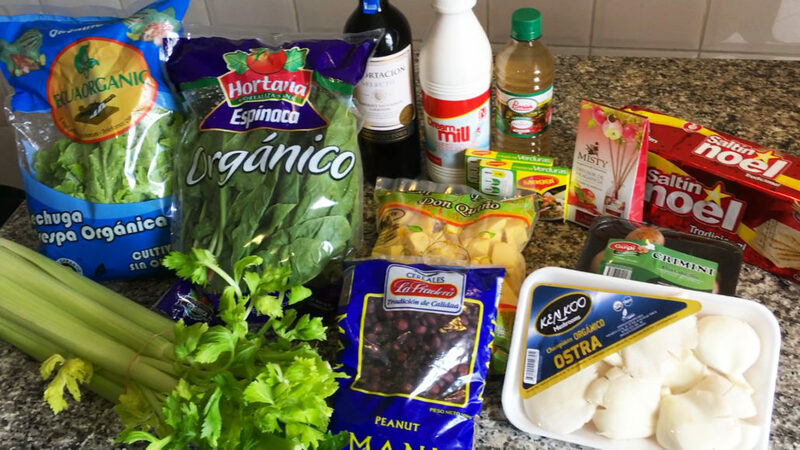 Esta mañana (this morning), we visited Supermaxi El Vergel to get some of our staple supplies like soy milk, mushrooms, apple cider vinegar, crackers, wine, etc. We also buy trash bags, laundry detergent, canned goods, spices, tofu, condiments and other packaged items at Supermaxi. 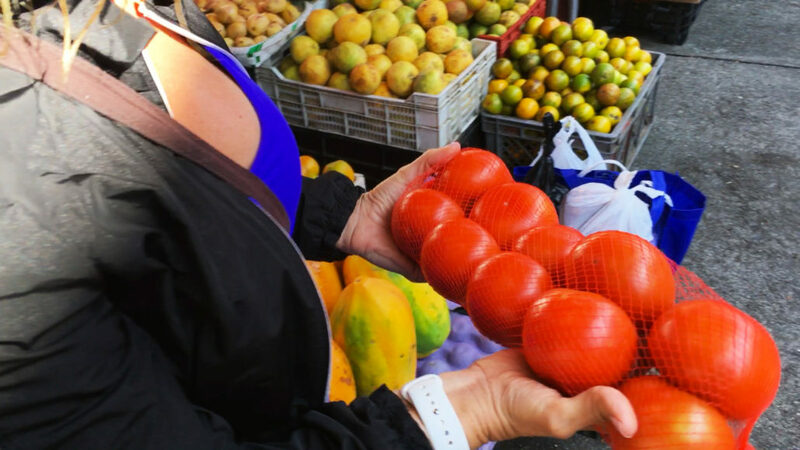 We typically buy all of our fruits and veggies at the mercado, but the mercados don’t carry everything and we really like Supermaxi El Vergel. It’s clean, reasonably priced and feels like a Safeway or Kroger back in the states. Oh, and the people who work there are all really nice and helpful. 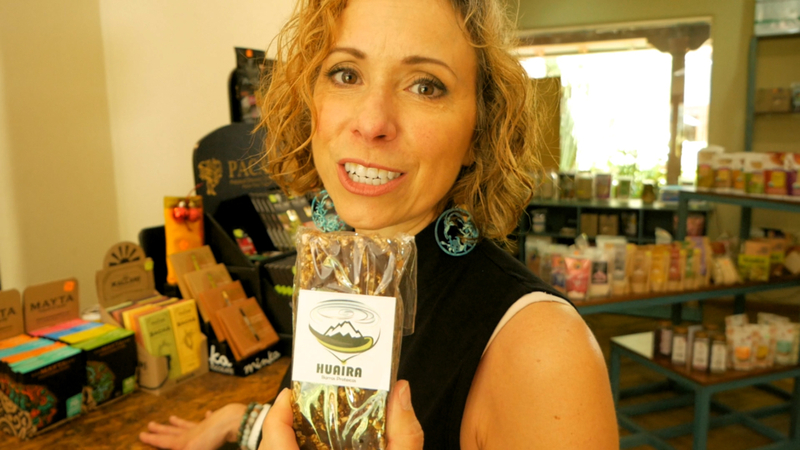 Check out our other video about Mercado 27 de Febrero Organic Thursday Market in Cuenca Ecuador for more info on mercados. We hope you enjoy this tour of Supermaxi El Vergel. We’ve also included some Spanish language learning opportunities for you. 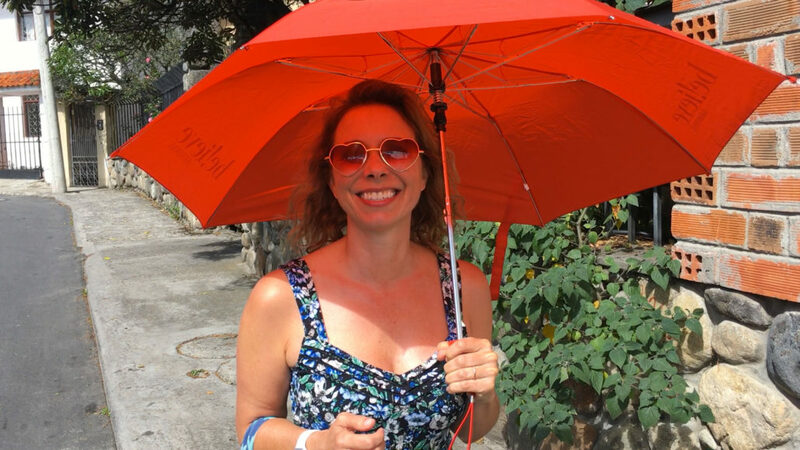 It’s often sunny and rainy on the same day…and in the same hour…in Cuenca, so Amelia always has her umbrella (sombrilla/paraguas) handy. There is technically a difference between a sombrilla and a paraguas in the Spanish language. 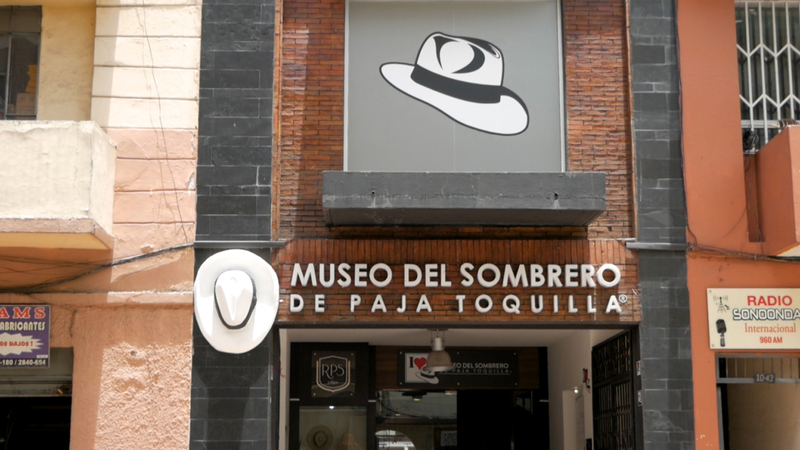 A sombrilla is specifically to provide shade from the sun, while a paraguas is specifically to provide protection from the rain. A sombrilla doesn’t have to be water resistant, but a paraguas does. However, Amelia uses the same umbrella for both. 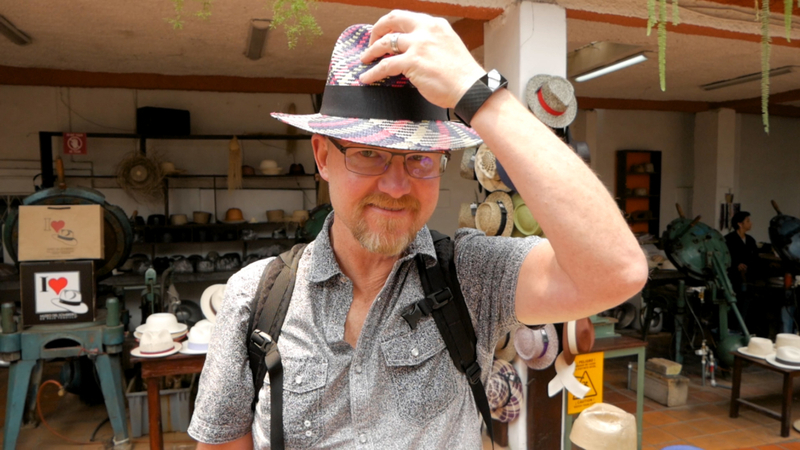 I always wear a water resistant hat and carry a rain jacket (un impermeable) in my backpack. You just never know when it’s going to rain. We love the Supermaxi El Vergel that’s near our house. It’s super clean, it has most everything we need, and the employees are very friendly. 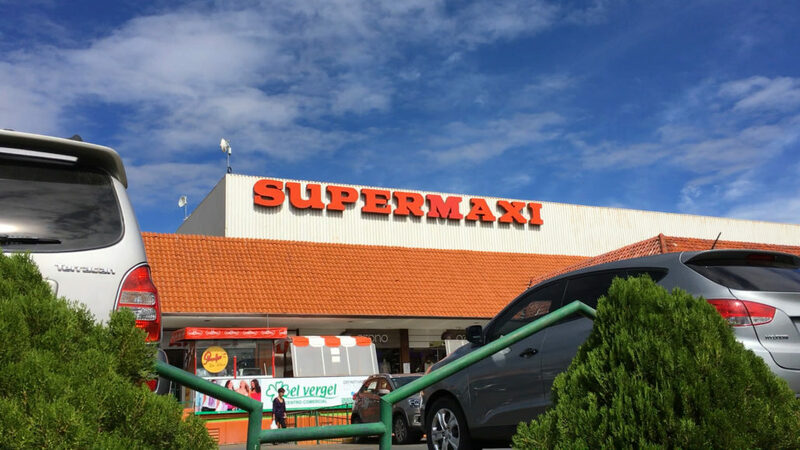 We buy most of our produce (fruits and veggies) at the mercado, but we buy almost everything else at Supermaxi. When we were researching our move to Cuenca Ecuador, we couldn’t find a video of the inside of Supermaxi so we didn’t know what to expect. We assumed it would be similar to a supermarket in the states, but we didn’t realize it would be just like a supermarket in the states. If you take someone from the states and plop them down in the middle of Supermaxi El Vergel, they wouldn’t know they were in Ecuador (except that everything is in Spanish). 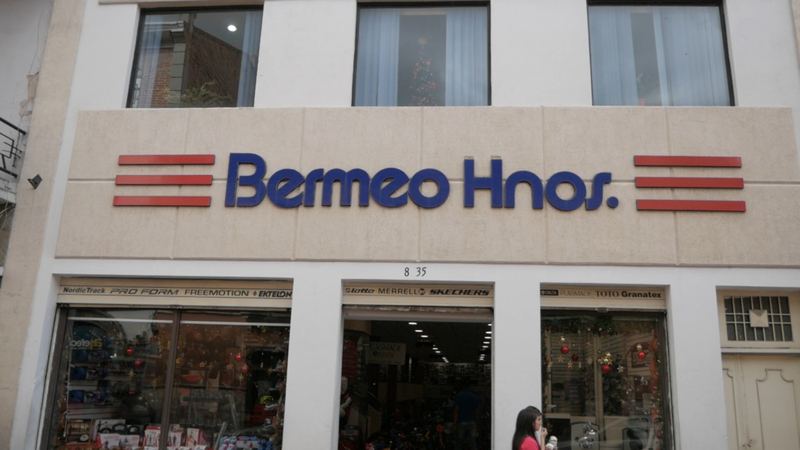 This is the health & beauty aisle in Supermaxi El Vergel. It looks a lot like a Walmart, Safeway or Kroger. They have most of the brands that you see in the states, which means most are tested on animals. 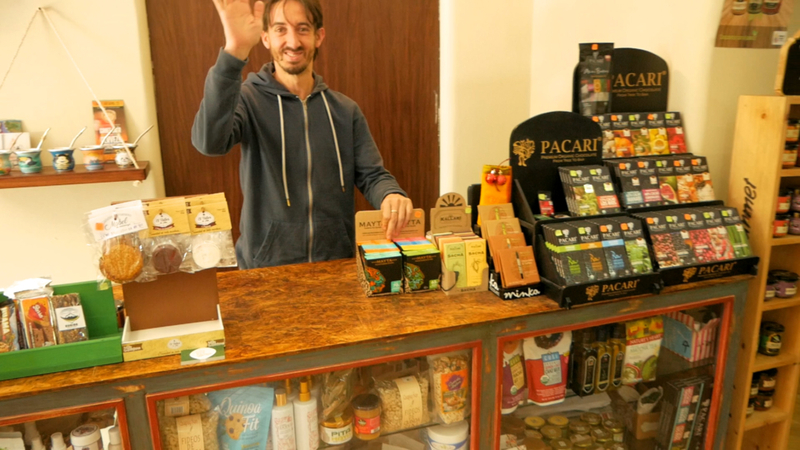 We try to buy things like deodorant and skin care products at one of the small organic stores around town. Most of them carry cruelty-free products, but they’re more expensive (as you’d expect). We’ll share videos of them later. 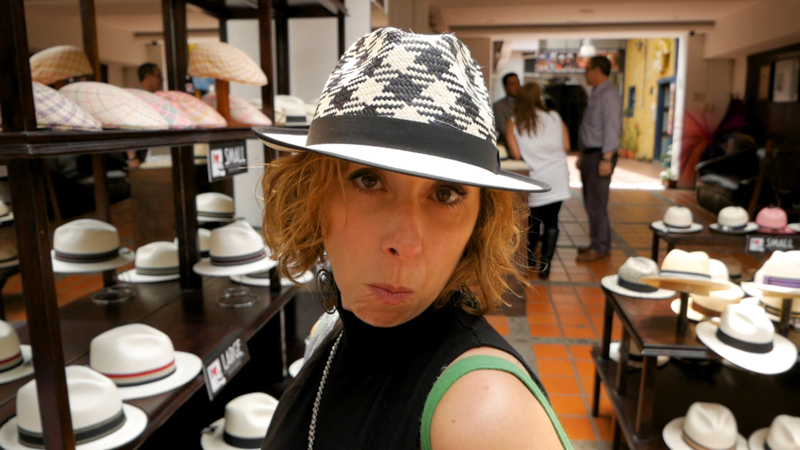 The prices on most things are lower than you’d pay in the states, but some things are similar or higher. 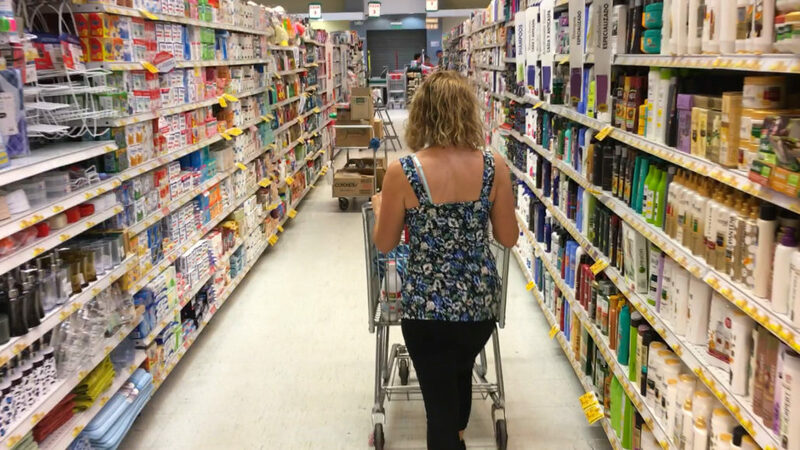 For example, sunscreen is a lot more expensive here, almost twice as much! Alcohol, processed foods and paper products are about the same price as the states. But food is a LOT less expensive here. Produce is about 1/3 to 1/10 the cost as the states. 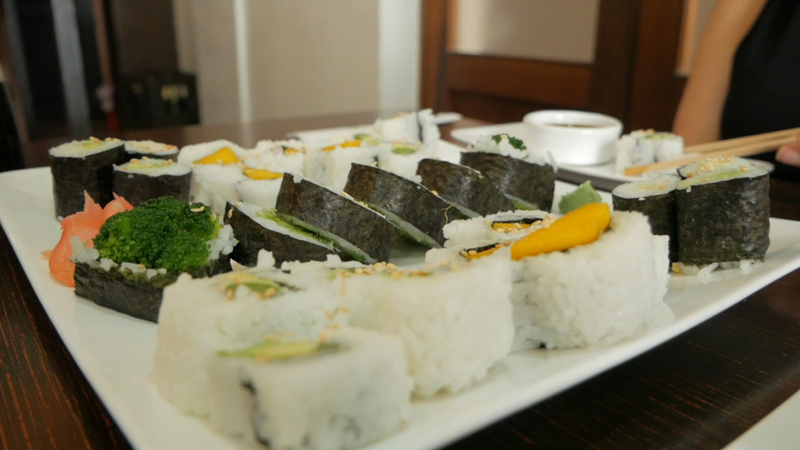 Plus, the fruits and veggies are much higher quality and MUCH more flavorful here. 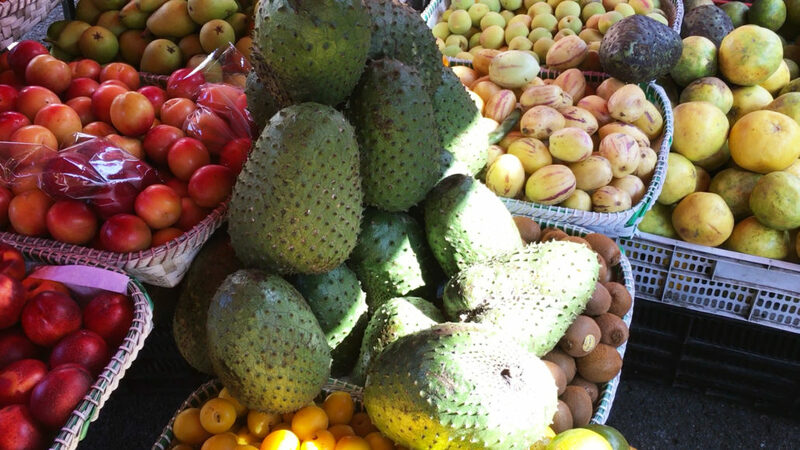 We usually get avocados, mangos and papayas 3 for $1. We can get 10 bananas for 50 cents, a huge bunch of Swiss chard or spinach for 50 cents, and 5 pounds of delicious yellow potatoes for $1. We were spending between $600 and $800 per month on groceries in Denver. Here, we spend between $100 and $200 per month, and the quality is far superior. 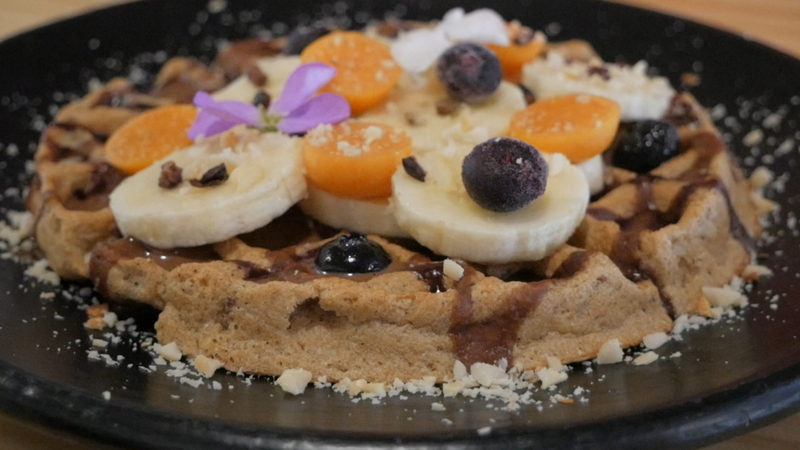 This is another thing we had a hard time figuring out before we moved here: are vegan processed foods available? And the answer is yes, they are. You can get both soy milk and almond milk, but that’s about it for milk alternatives. They don’t have a GMO label, so we’re assuming they’re GMO-free since all products containing GMOs must be labeled here (see more on that below). 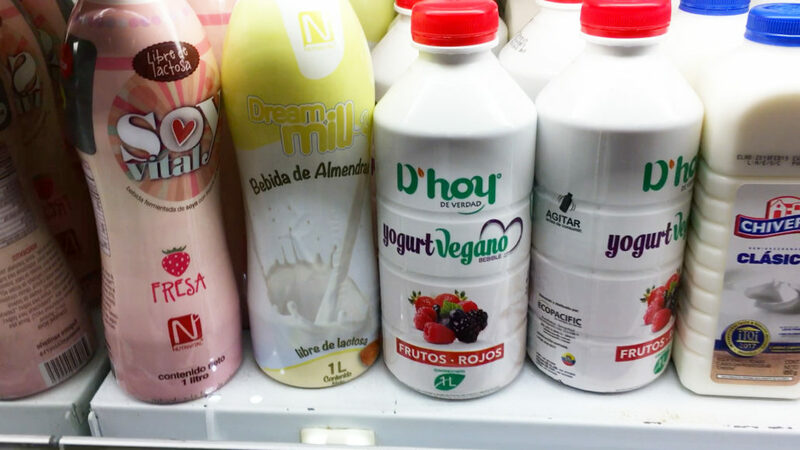 You can also get vegan yogurt (yogurt vegano), but yogurt is a lot different here. It’s a creamy liquid that you pour out of the container instead of eating with a spoon. It’s not thick like we’re used to. We haven’t found any vegan butter yet. They do have several different types of dairy-free margarine, but we don’t eat that so we go without butter. Instead, we use avocado, peanut butter or jam on our toast. 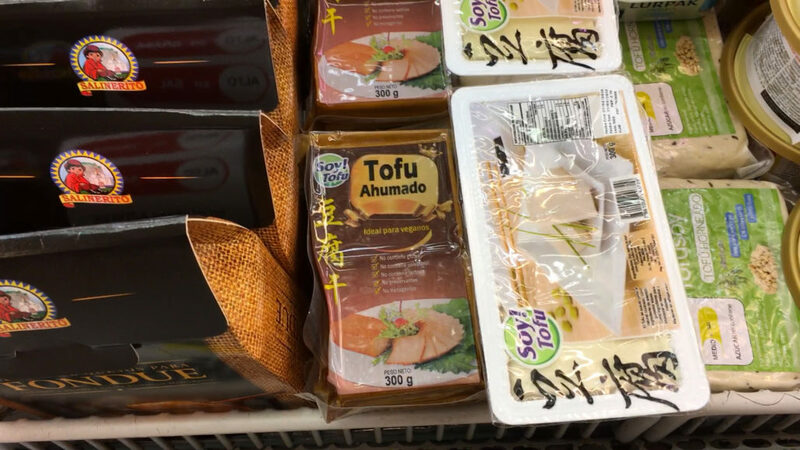 They also carry a few different types of tofu, but they don’t always have all of them at the same time. They don’t have a GMO label so we’re assuming they’re non-GMO, but they’re probably not organic. That means pesticides were probably used, but no genetic engineering. The smoked tofu (tofu ahumado) is very flavorful and a nice addition to stir fries. The regular tofu is just like tofu in the states and the density is equivalent to firm/extra firm. The baked tofu (tofu horneado) with basil was also delicious. They also have several different types of meat substitutes for hamburgers, hotdogs and sausage. We haven’t found any TVP (textured vegetable protein) yet, but lentils make a good substitute for that. We don’t buy many meat substitutes anymore since we eat a mostly WFPB (Whole-Food Plant-Based) diet so we don’t visit this section very often. It’s used to be located between the conventional processed meats and the butchered meats, but they have since moved them next to the soy milk behind the guard desk at the entrance. 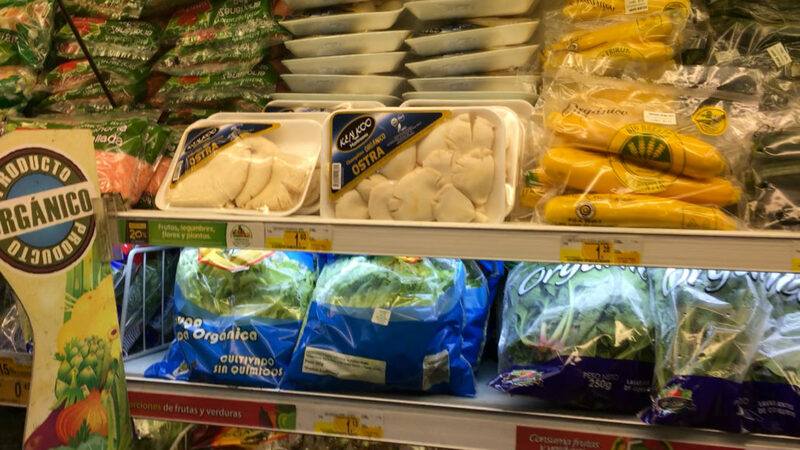 They moved the tofu there, too, so all of the cold vegan products are next to each other. Supermaxi doesn’t carry liquid vegetable broth (at least we haven’t found any). 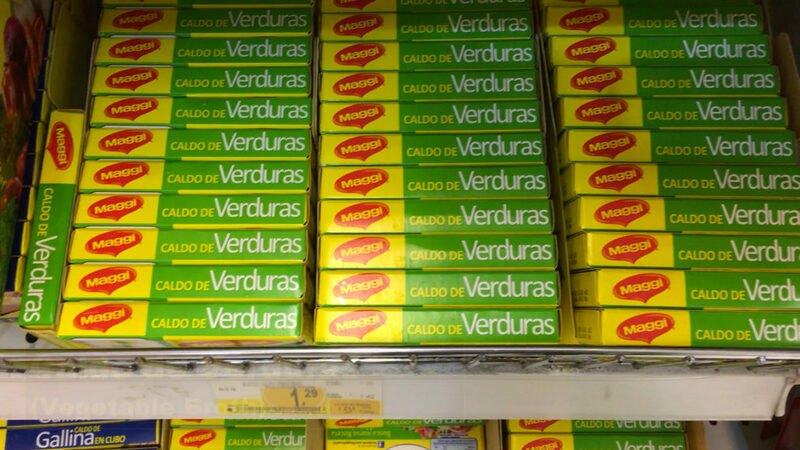 But they do carry cubed vegetable broth (caldo de verduras) that dissolves in water. 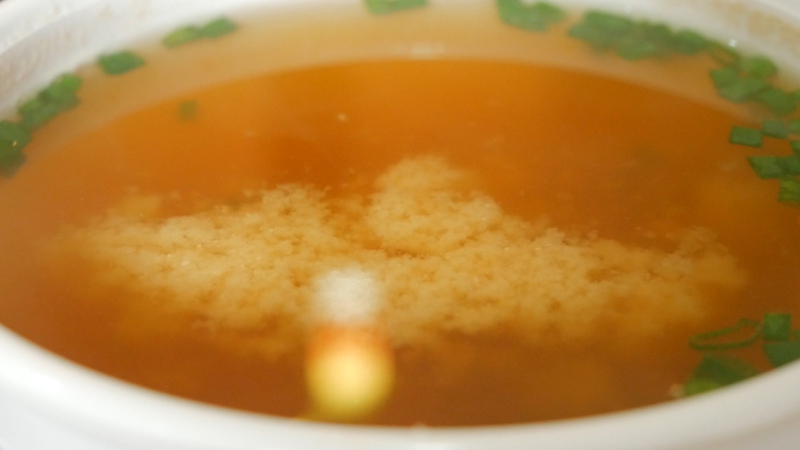 HOWEVER, this vegetable broth from Nestlé contains trans fats in the from of vegetable shortening. We no longer buy this for obvious health reasons. ACV (apple cider vinegar) is a staple in the vegan kitchen, and Supermaxi carries a few different brands of it so you won’t have to go without that. They also carry several different types of oils and vinegars. 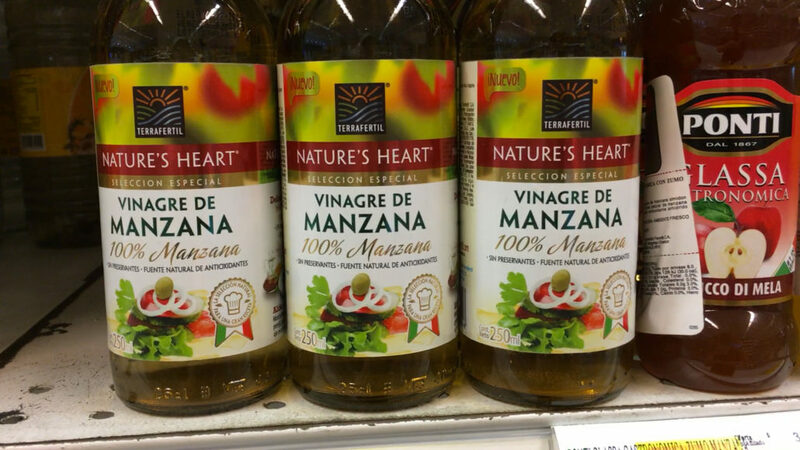 We rarely cook with oil, but we use a lot of vinegar on salads and in recipes. 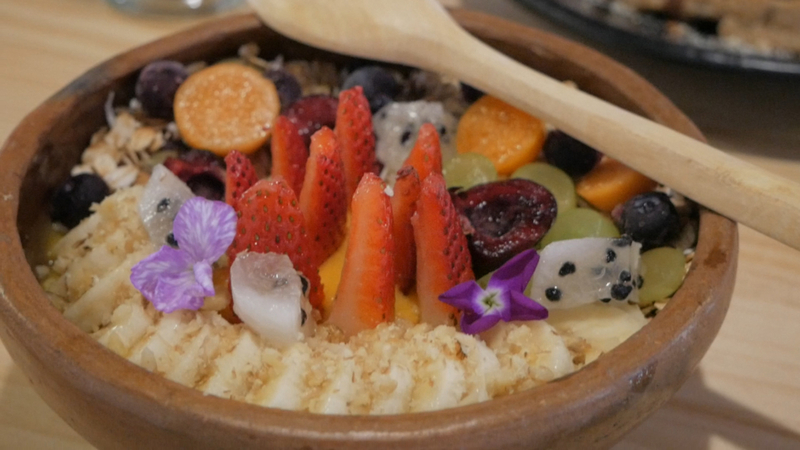 Most quinoa comes from Peru, which shares Ecuador’s southern border. That means it doesn’t have far to travel so it’s much cheaper here. 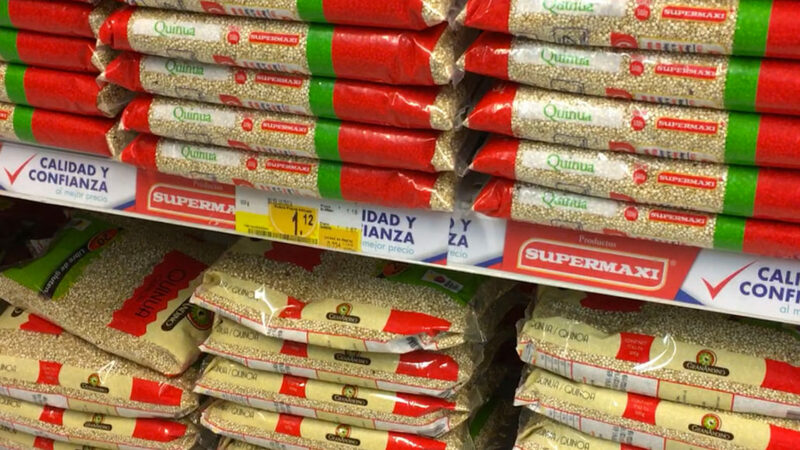 This large bag of quinoa is only $1.12! 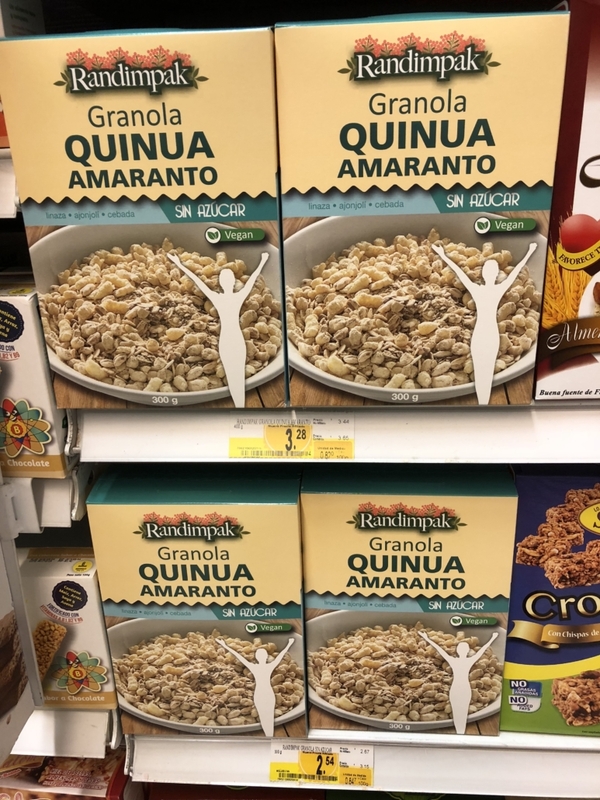 Quinoa has gotten so expensive in the states that we stopped buying it, but it’s back on the menu here! 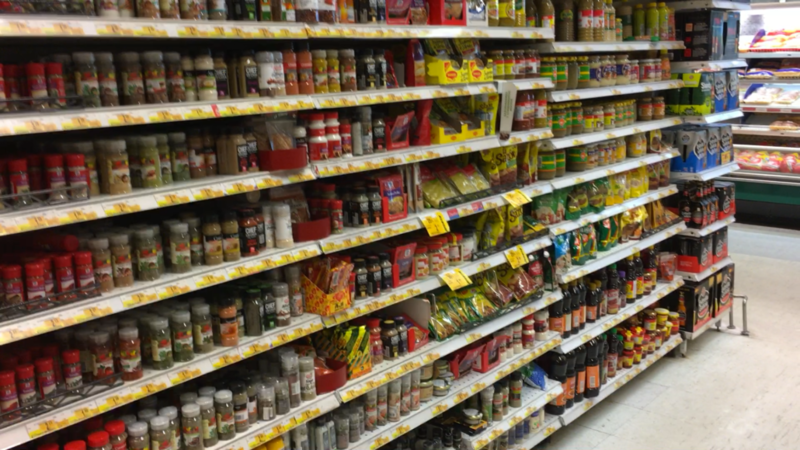 We cook with a lot of spices, so we were happy to see such a large spice selection at Supermaxi. 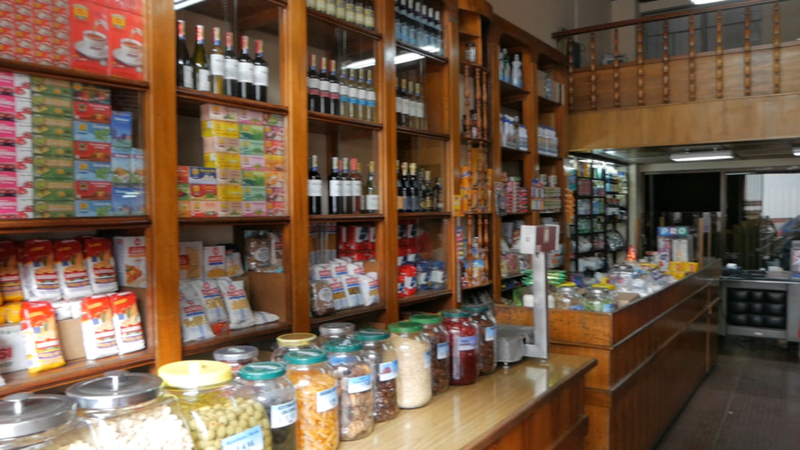 There are some independent spice shops in El Centro that we also visit for some of the rarer items, but we’re able to find almost everything at Supermaxi. 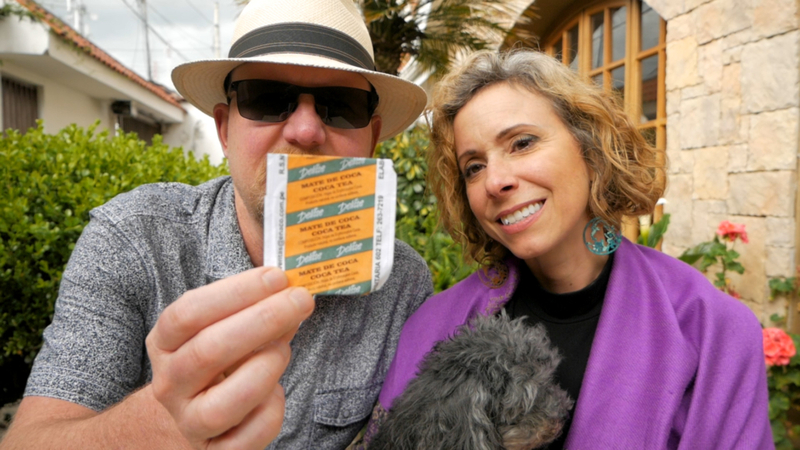 The spice package labels are in Spanish, so remember to take your translation app with you. Supermaxi offers FREE WI-FI so you can look things up online, too. 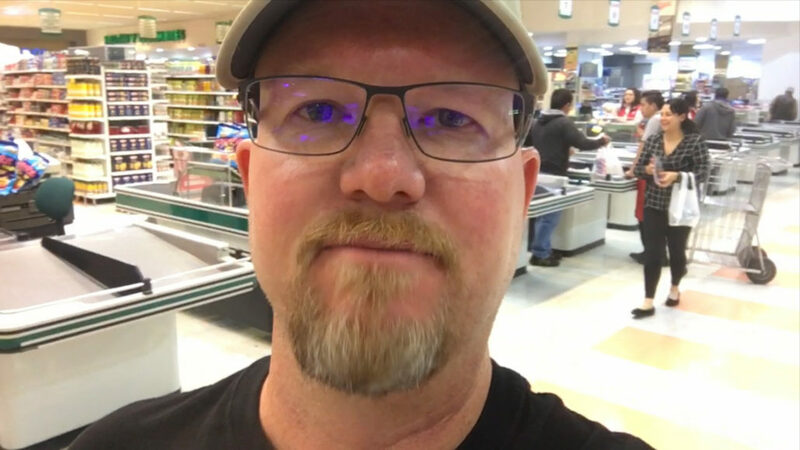 One of our YouTube viewers asked about vegan cereal options at Supermaxi. They have a large healthy cereal section, but most have oil and/or animal products of some sort. However, this brand is completely vegan and oil-free. 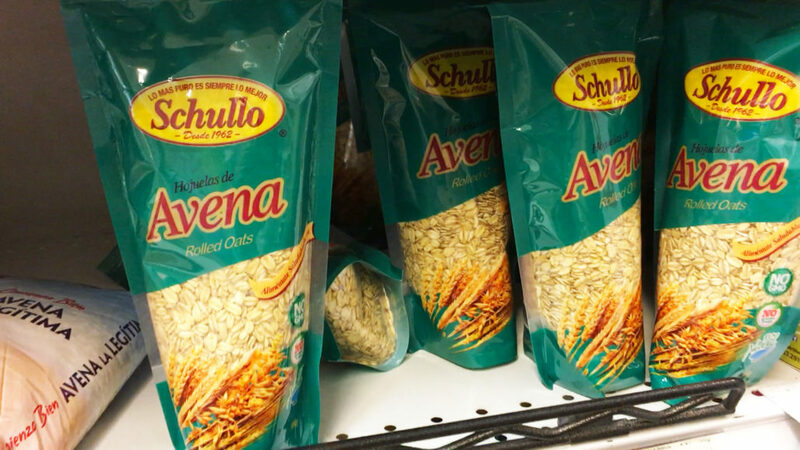 We ate rolled oats (hojuelas de avena) nearly every morning back in Denver, either cooked or uncooked, so we were concerned we wouldn’t be able to get them here, but we can! They have several different brands and types of oats: conventional, non-GMO and organic. We prefer the non-GMO kind because it’s a lot less expensive than the organic. We have even found steel cut oats on occasion. Last time Supermaxi had them, we bought 5 containers! 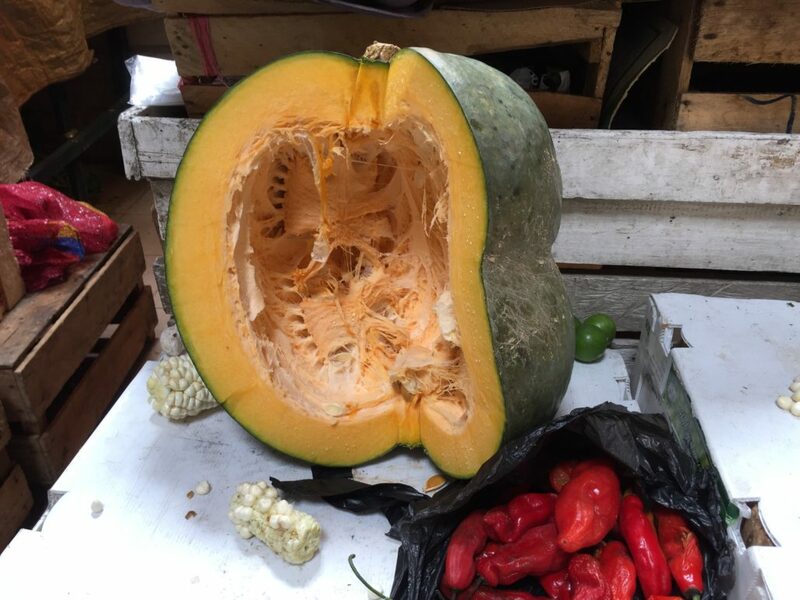 One thing that is sorely lacking in Ecuador is squash. This is the only type of squash that we’ve found. It’s called “zapallo” which literally translates to “pumpkin,” but it certainly doesn’t taste or look like a pumpkin. We use zapallo in our stir fries a lot since it’s so low calorie and filling: 100 grams has only 24 calories and 3 grams of fiber! That means you can eat it guilt-free! It also has a very mild flavor so it takes on the flavor of the spices in your recipe. 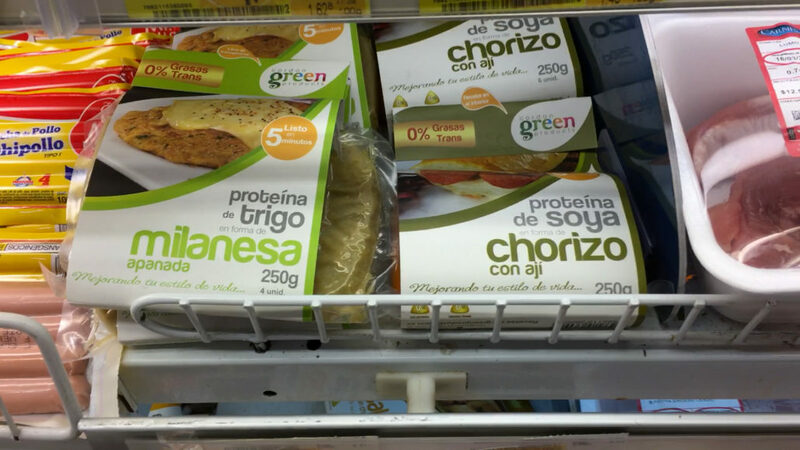 Supermaxi has a small organic produce section with lots of delicious options. 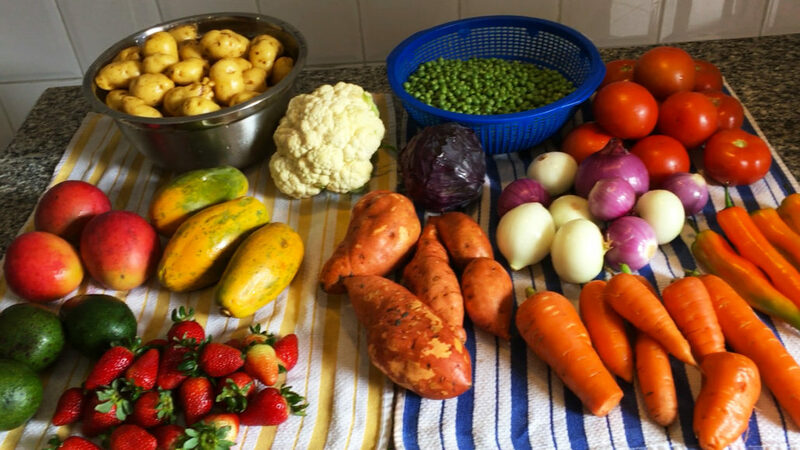 Ecuador doesn’t allow GMO crops to be grown in the country, so the quality of non-organic food is already much higher, but you can find lots of organic fruits and veggies here, too. Mercado 27 de Febrero also has a special organic market every Thursday morning and there are several organic popup markets around town, if that’s uber important to you. 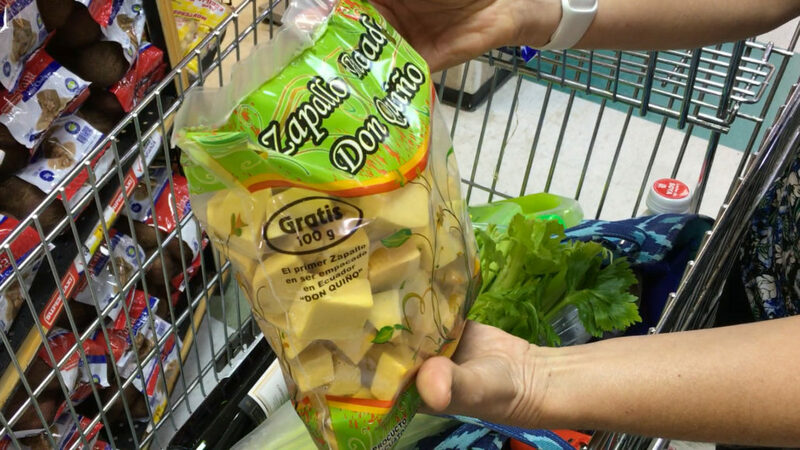 While we continue to struggle in the states to make food labels easy to read, the little South American country of Ecuador has already done it. Every packaged food has this easy to read label indicating the amount of sugar, salt and fat contained in the product. The highest level ingredient goes on top and the lowest goes on the bottom. 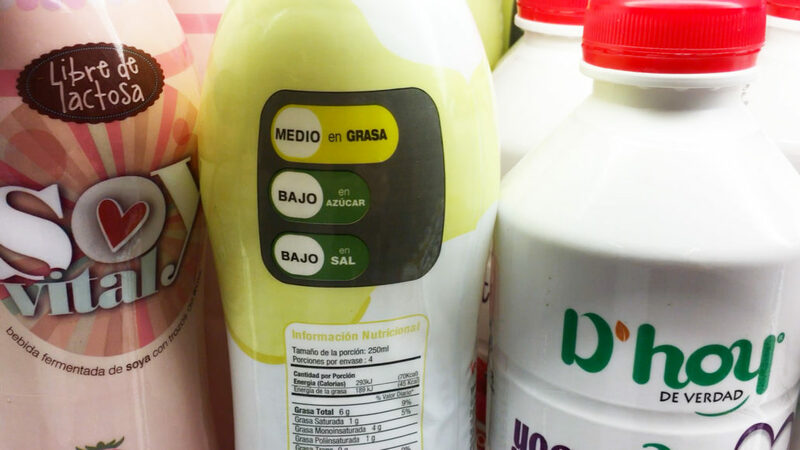 The options are high (alto), medium (medio) and low (bajo). They’re also color coded for extra easy understanding: red is high, yellow is medium and green is low. It’s so simple it’s hard to believe the US can’t figure out how to do it. Ecuador also has the standard nutrition label that looks just like the labels we see in the states, except they’re in Spanish and the amounts are all metric. You won’t often see serving sizes in cups (tazas) or ounces. They’re either grams or milliliters, which makes it a bit tough for us Americans, but we’re learning. 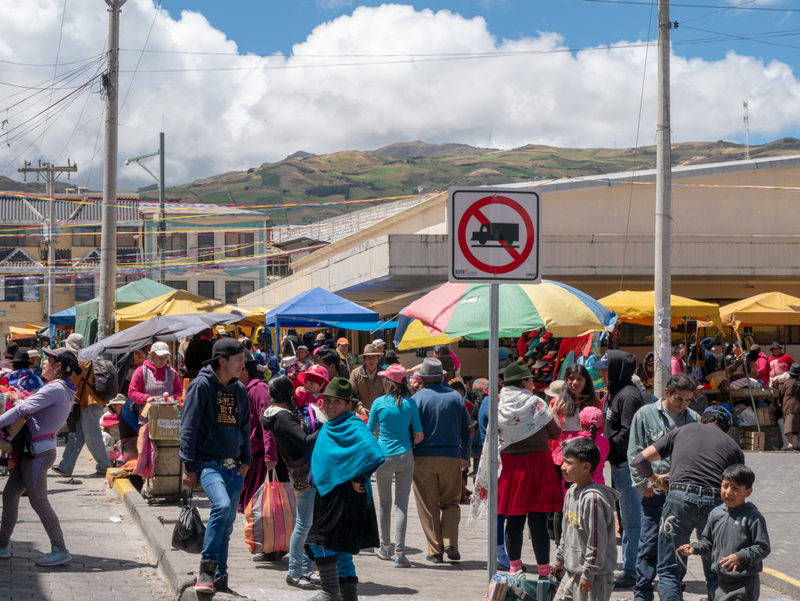 While Ecuador doesn’t allow GMO crops (more accurately called GE or genetically engineered crops) to be grown inside the country, they do allow some products containing GMOs to be imported. 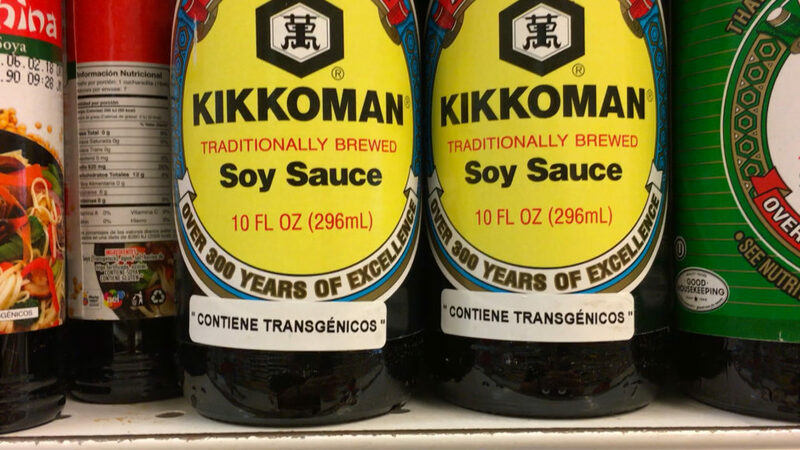 We were never sure if this Kikkoman Soy Sauce contained GMOs back in the states, but I think it’s a safe bet that it does. Thanks to Ecuador’s mandatory GMO labeling, all products containing genetically engineered ingredients must sport this “contiene transgénicos” sticker. Again, it’s so simple that a tiny developing country in South America can do it, yet GMO foods are still not labeled in the states. Gee, I wonder why. Supermaxi has similar checkout lines to grocery stores in the states and they also accept credit cards. You just need to go to the customer service desk at the front of the store near the express lane and get a free Supermaxi card. You’ll need your passport or cedula (government ID card) to get it, but we just keep a picture of our passport on our phone for these types of circumstances so we don’t have to carry it all the time. One thing that’s different with the checkout lines here is that you can’t push your shopping cart through the line. The carts are too wide to fit so they stack up at the entrance of the checkouts and you often have to move them out of the way to reach the checkout conveyor belt. Occasionally, someone gathers up all the carts and puts them back, but it can become quite the obstacle course until that happens. 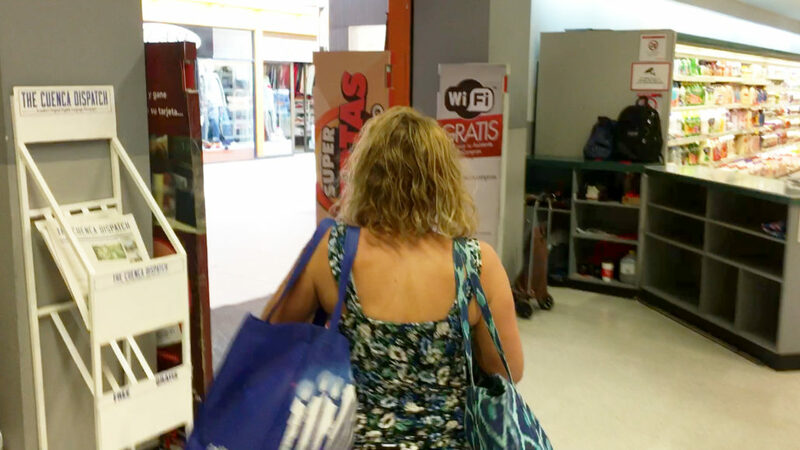 If you have too many bags to carry, the baggers have a special cart that they load (you can see it behind the lady in the photo above). Then they’ll wheel it out to the parking lot or one of the waiting taxis. There is a bag check with a security guard at the entrance of the store. You’ll need to check any bags or backpacks you have (except your purse or empty grocery bags) and he’ll give you a little claim tag so you can get them on your way out. The guard is standing off to the side in this photo so you can’t see him, but someone is always there watching the bags and checking them in for customers. Everything you see in this photo cost us a little less than $30. The wine was the most expensive thing, and it cost about $7. They have several descent wines from Portugal, Spain and Argentina that are less than $10 per bottle. We hope you enjoyed the video of Supermaxi El Vergel in Cuenca, Ecuador. 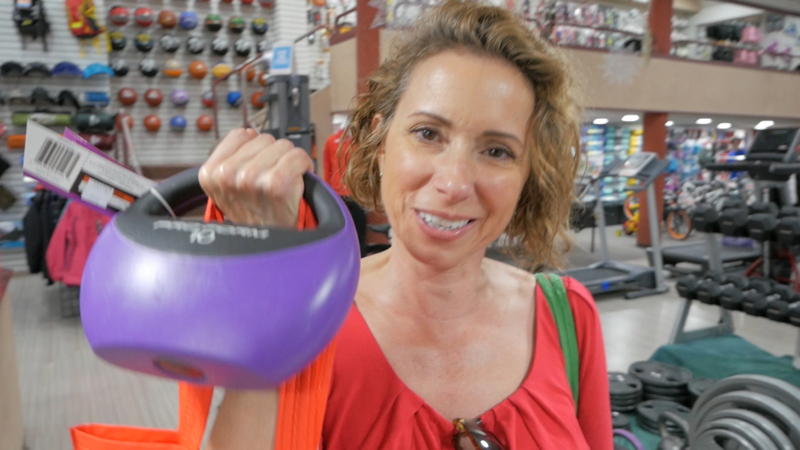 If you want to know if they carry something that we didn’t discuss in the video or the blog post, let us know in the comments and we’ll look for it the next time we go. 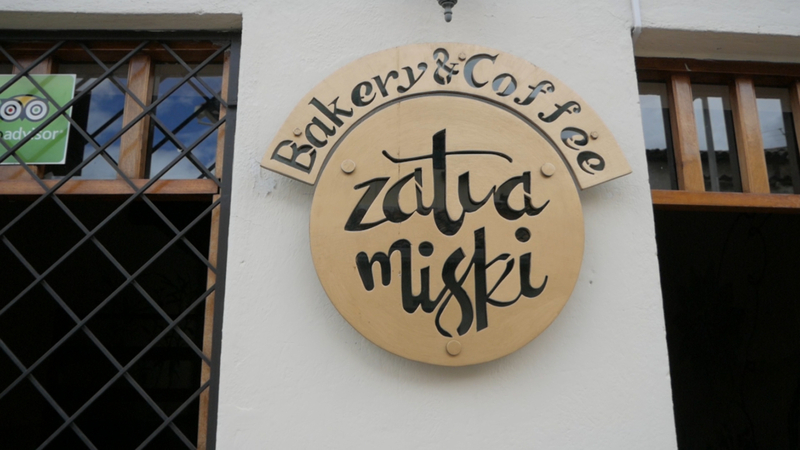 On most Thursday mornings, you can find us at the organic popup market outside Mercado 27 de Febrero in Cuenca Ecuador. It’s a short 10 minute walk from our house so it’s very convenient. We’re not 100% sure everything is truly organic, but everything is 100% beautiful and delicious. And since the prices are so reasonable, we figure it’s worth it, regardless. 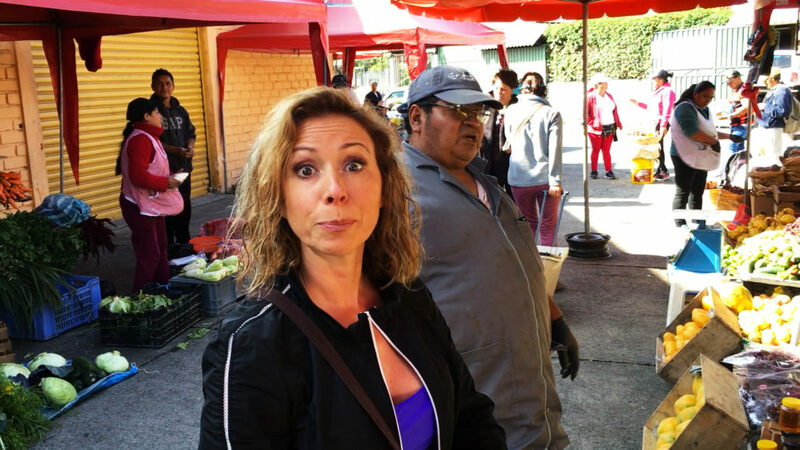 We hope you enjoy seeing the beautiful fruits and veggies, and the interesting people we talk to at our favorite mercado. 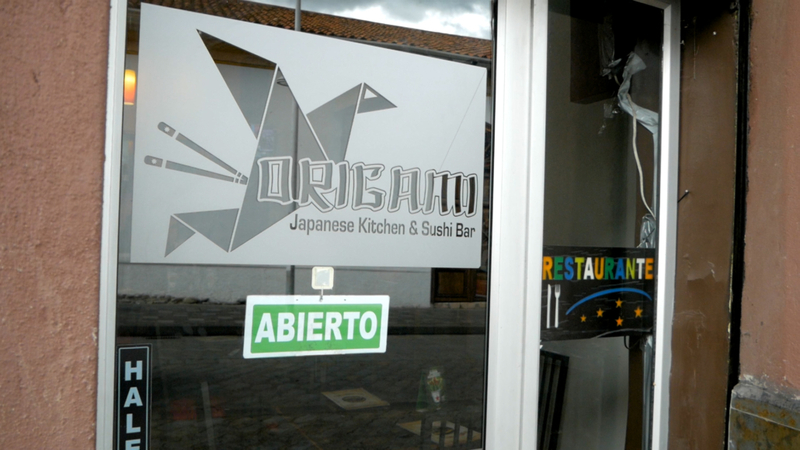 We’ve also included some Spanish language learning opportunities for you. 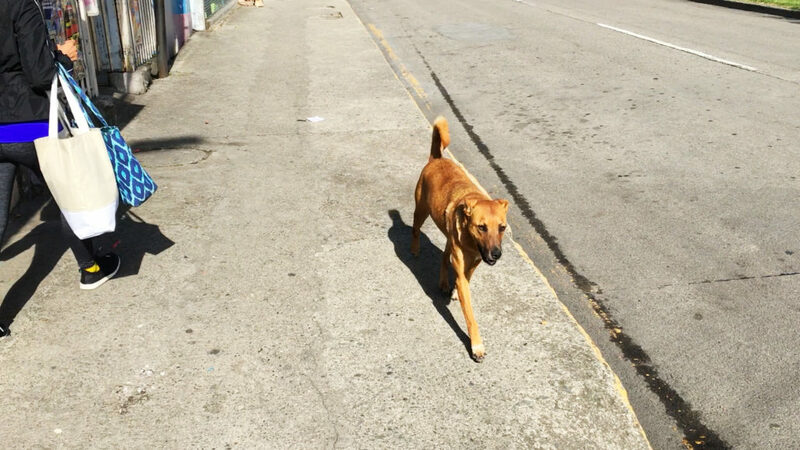 It’s common to see dogs, stray or otherwise, walking down the sidewalk like they’re heading to work…and some are. They have places they frequent where people feed them or food scraps can be found. Then they return home at the end of the day. The dogs here are much smarter than those in the states. We’ve actually seen dogs stop and look both ways before crossing the street. They go about their days here just like they’re little furry humans. The mercado is usually bustling with activity, but we were there very early on this Thursday morning because our littlest dog woke us up at 5:30am to go outside. 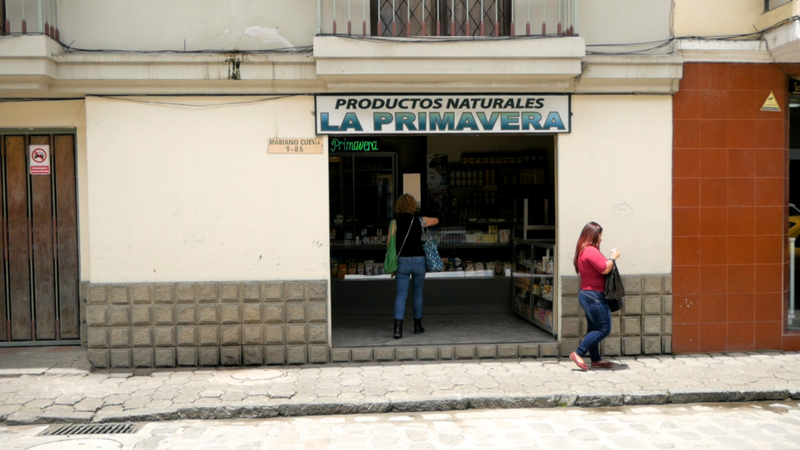 A lot of the shops in the mercado weren’t open yet, but the organic market was already busy. 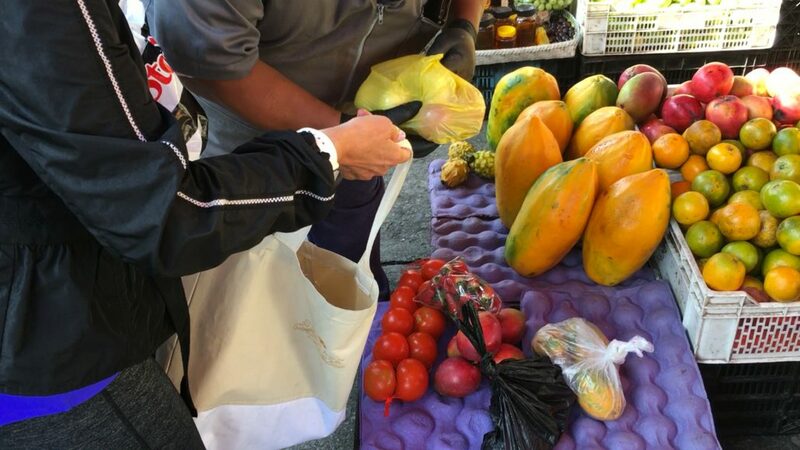 We love the fresh and delicious fruits and veggies at the organic Thursday market. And the people are super nice and helpful. We usually visit the same people every week for the same things. These are our yellow potato and avocado ladies. And we sometimes buy other things from them, too. We always have some of these on hand for snacks and side dishes. I cook a big batch in our pressure cooker and keep them in the fridge. Then we just warm them up in the microwave (microwaving is healthy, despite the misconceptions). They’re so buttery and delicious that you can eat them without anything on them. However, we usually top them with hot sauce, Tabasco, salsa, refried beans or just a little salt and pepper. Avocados are usually 3 or 4 for a dollar, and they’re deliciously creamy. They also last a long time, unlike avocados in the states. 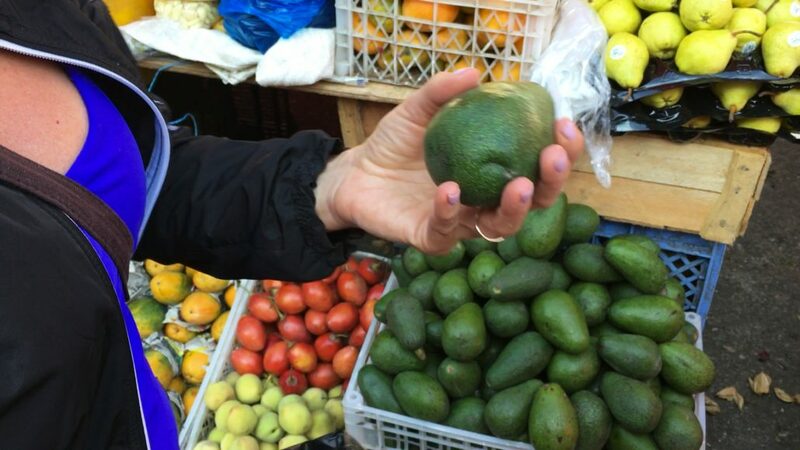 You can buy a soft avocado and it’ll still be good to eat 3 or 4 days later. However, if you buy a hard avocado, you’ll need to wait a week or two before it’s ripe enough to eat. The tomatoes are juicy and delicious, just like the tomatoes from my grandpa’s garden when I was a kid. You can literally eat them like an apple. Be sure to get ones that are a little soft when squeezed. We’ve found some that have a tough inner layer. They still taste good, but they’re not as juicy. This is a large, prehistoric looking fruit. The inside is white and fleshy with lots of large black seeds. Amelia loves these, but they’re too sour for my taste. I prefer chirimoyas (sweet sops), which are smaller and taste like cotton candy. 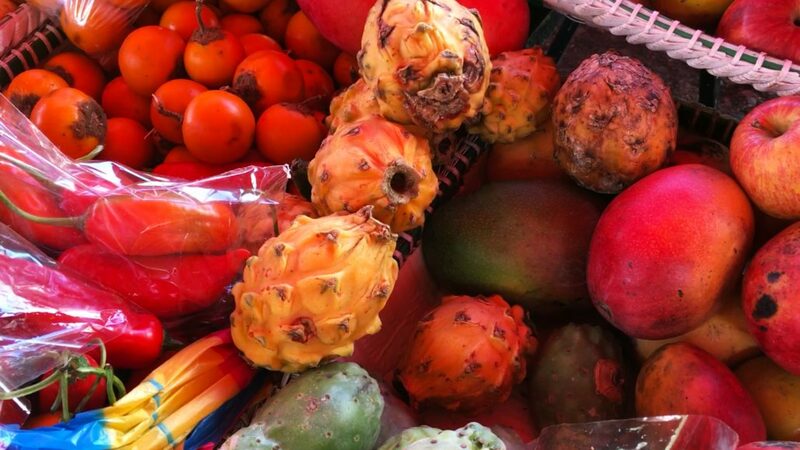 The yellow funky look fruit in this picture is called a Pitahaya (or Dragon Fruit). It has a white, juicy interior with little black seeds, and it tastes like candy. 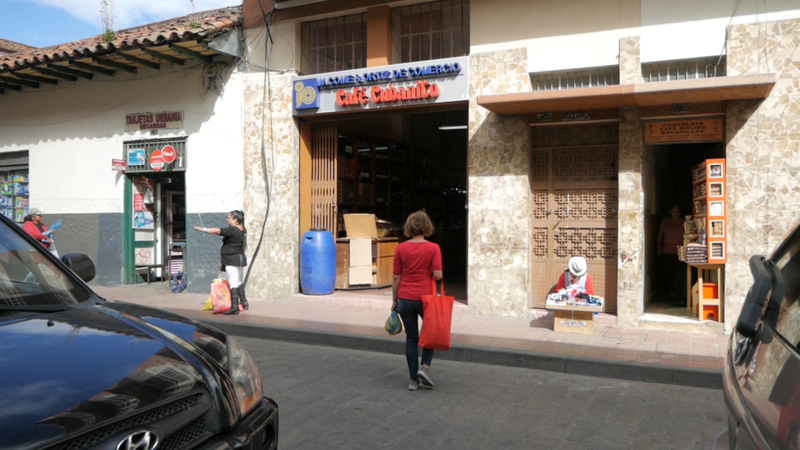 It seems that most things at the mercados are sold in one dollar increments. You can ask for 50 cents (cincuenta centavos) or $2 or some other amount, but most things start at $1. Once you’ve picked out everything you want, they’ll put it in your bags and add the price up as they go. We bought $7.50 worth of fruit and veg from this vendor, and another $7.50 from another vendor today. One thing we really like about Ecuador is that they use the dollar for their currency. Not only does it make shopping much easier (we don’t need to do currency translations in our heads), but the dollars we earned back in the US go much further here. The $15 worth of organic produce we bought today would have easily cost us $80 to $100 in Denver (and they wouldn’t have tasted as good). 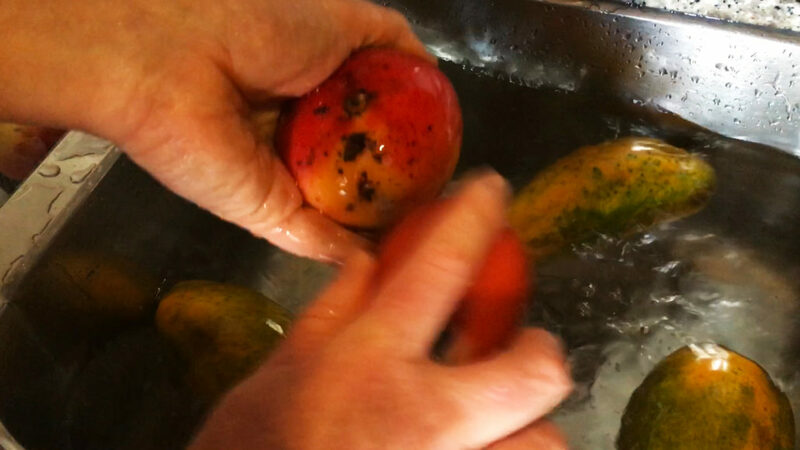 We always wash the fruits and veggies as soon as we get home so they’re ready to eat when we want them. Even though these are (supposedly) organic, they still need to be washed, especially the veggies. They sell veggie wash in the grocery stores here, but we don’t use it. I “Gregered” this topic when we went plant-based and found that vinegar works better than the chemical washes, and simple salt water works even better than vinegar. All you need is a 10% salt water solution (that’s 1 part salt to 10 parts water) to clean your veggies. We also scrub the veggies with a brush to get them extra clean. Then we rinse them in fresh water to remove the salt and let air dry. This haul of fresh, organic fruits and veggies cost us about $15. Not only are they cheaper here, but they taste 100 times better. They taste like the fruits and veggies tasted when we were kids. They’re juicy, flavorful and delicious. 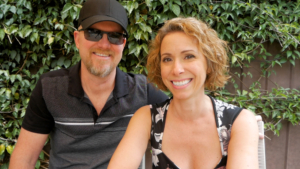 You’ll see in our videos that we like to laugh and have fun. 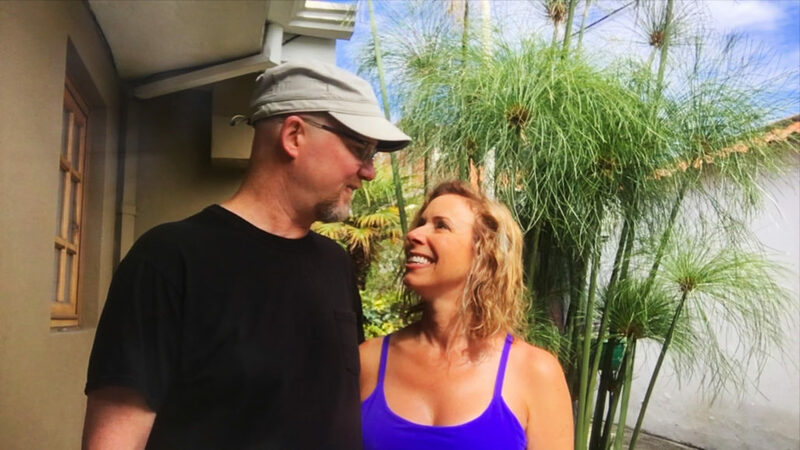 We love living in Ecuador and we’re very thankful to have each other. Sharing this unconventional and exciting experience with a kindred spirit makes it even more enjoyable. 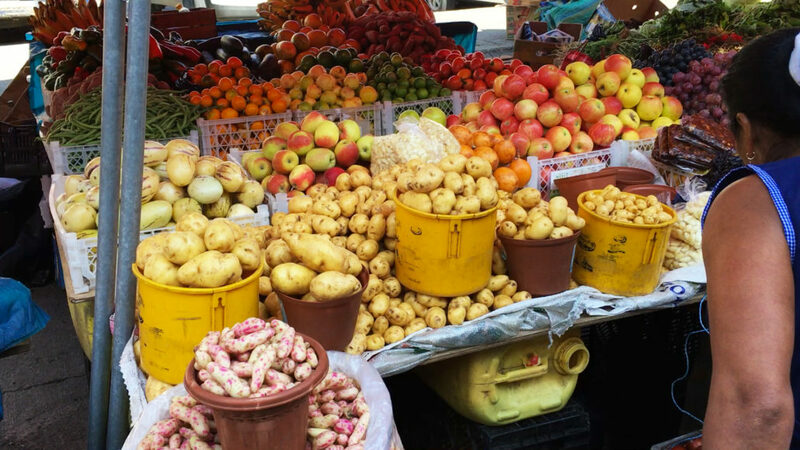 We hope you enjoyed our trip to Mercado 27 de Febrero in Cuenca, Ecuador today. Please remember to like, comment and share our video, and also subscribe to our YouTube channel. If you’d like us to make a video about something specific or if you have questions, please let us know in the comments. ¿Tienen arvejas? – Do you have peas? 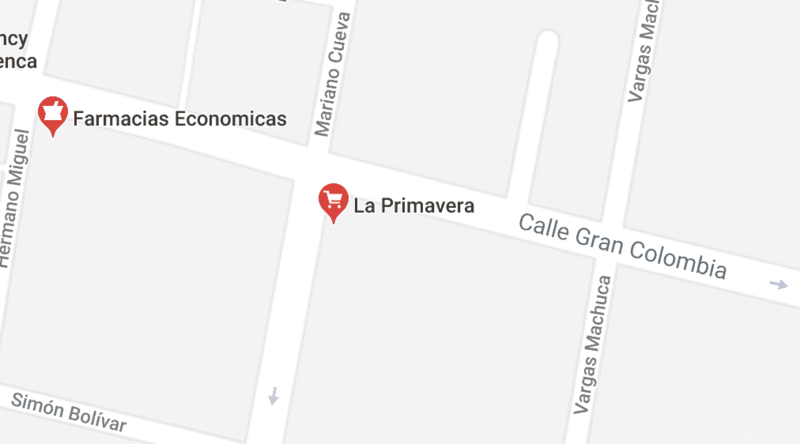 ¿Una libra o dos? – One pound or two? Creo que es todo para hoy. – I think this is all for today.